It's only natural that human beings like to rely on certainties. Many people like to have an understood order about the things around them. 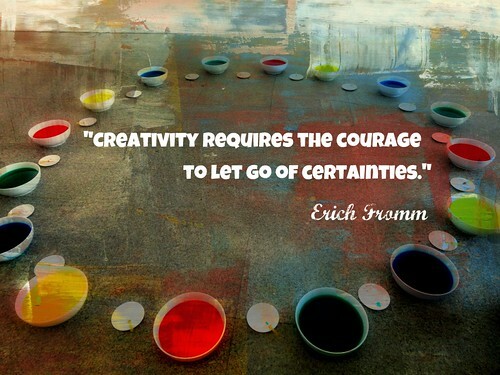 But as German philosopher and psycho-analyst Eric Fromm once said, "Creativity requires the courage to let go of certainties." This means that to be truly creative, you have to be prepared to see your assumptions about things, even things you were certain were true, be proven wrong. Some people are content with simply being certain about particular things, even if they are actually untrue. This is why over the years so many works of creative genius have been challenged, sometimes with harsh resistance. But to be truly creative, we have to push the boundaries of our own understanding of the world around us. While there is likely to be resistance, this is actually a good thing. It means that we are challenging so-called certainties. Being creative can be a dangerous task. Some new ideas are more openly welcomed than others. But openness to an idea cannot accurately measure if it's going to be proven truly useful or not. The more resistance there is to something you've created, the more it's challenging people's understanding of whatever your work might be. New ideas are often considered dangerous, and that's OK.
Be dangerous. Let go of what you think is certain. Don't let anyone tell you that it certainly can't work. Be creative and challenge not only your own assumptions, but everyone else's, as well.